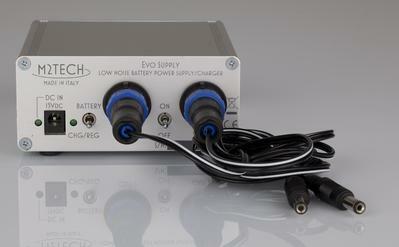 Evo Supply is a battery-based high performance power supply. 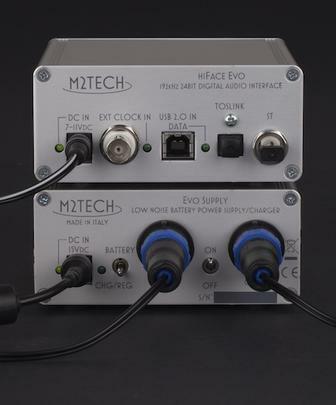 It’s the perfect companion to the hiFace Evo and other 9V-operated M2Tech devices. Evo Supply features a Li-Ion battery with 2200mAh capacity (minimum), an integrated battery charger and a low-noise regulator which is used to provide current to the load while the battery is being charged, thus ensuring continuous operation to the load. Charge time is about three hours, the best choice to ensure a long battery life. Evo Supply delivers up to 1A (peak) on 9V (low-noise regulator) or on 9.5V to 11V (battery). Two outputs are available for more versatility. A switch allows for turning the load off when not used to save on battery charge. Another switch allows to select the operation mode: automatic charge or charge inhibit. Two leds indicate the presence of the wall adaptor and the charge in progress. In automatic charge mode the battery charger starts charging the battery every time the battery voltage drops below a low threshold. During the charge, the low-noise regulator feeds current to the load. At the end of the charge process, the output reverts to the battery. In charge inhibit mode, the battery is used down to the low threshold and then the load is disconnected to avoid excessive depletion. Charge is then started by switching to automatic charge mode. The battery is protected against overcharge, overcurrent and excessive depletion. A 15V/2A detachable wall adaptor provides current for battery charging and load powering when the battery is being charged. The user may disconnect the wall adaptor after battery is fully charged in order to reduce interferences to a minimum. Evo Supply features heavy duty output connectors for reliable contacts Two cables terminated with 5.5/2.1mm plug (positive on tip) and a universal power wall adaptors are included in the package. 1) LONG BATTERY DURATION: around 7 hours when powering the hiFace Evo. 2) VERY LOW NOISE even when using the internal regulator. 3) STYLISH ALUMINUM CASE matches the look of the hiFace Evo.